My day job is pastor of the Cathedral Parish, which is the merger of our three 19th century parishes around the Capitol Square: St. Raphael, St. Patrick and Holy Redeemer. This is now the single parish for downtown Madison and the isthmus. My most memorable caffeine goes back to my childhood. I’m of Norwegian heritage on my father’s side, and his mother was very committed to making sure I appreciated coffee. To her, drinking coffee was an essential part of my Norwegian identity, and she took it upon herself to make sure I became a coffee lover. Of course, coffee isn’t a flavor that children naturally love, but she had a strategy. I don’t think I was 10 years old yet when she started giving me a cup of black coffee, sugar cubes and a straw. She instructed me to put the sugar cube into my mouth and use the straw to drink the coffee through it. She got me hooked! I drank a lot of coffee in the seminary – even in high school seminary. It was a boarding school, so we were there for two weeks at a time. At that point, we didn’t have coffee in the cafeteria so I had my own little coffee pot in my room. My breakfast was often my coffee with homemade cookies or donuts that my other grandmother sent back to school with me. I might have been a little spoiled by my grandmothers. I also have very fond memories of coffee in France. At most every hotel, the morning starts with a bowl—a huge cup with no handles—of coffee, which you could have black or white (with milk). It was served with a croissant (one per customer) and as much bread and unsalted butter as you wanted. Nothing better. My current caffeine of choice is black coffee. I really don’t like flavored coffees—I want it to taste like coffee. Well, on very special occasions, I might put a little Jameson’s in it – I’ve got some Irish on my mother’s side. My favorite place for caffeine is home. I get Colectivo French Roast, grind it the night before and set it to brew in the morning. The person I’d love to share a cup of caffeine with is Bishop Cletus O’Donnell. He was the bishop of the Madison diocese while I was in school and during my early years as a priest. I would love to have the opportunity to sit down with him, now that I’m an experienced priest, and learn more about the various situations he dealt with and the thought process behind his decisions. 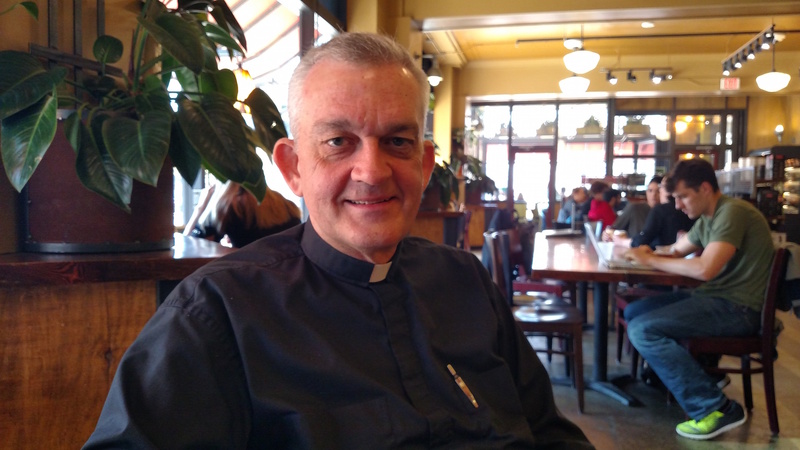 Bishop O’Donnell is a key reason the Madison diocese hasn’t had the same level of problems related to the abuse scandals that many dioceses have. When others took the view that these priests could be treated or that a “merciful” approach was appropriate, Bishop O’Donnell dealt with the priests in question swiftly and definitively. This was very much against common practice at the time, but put him in the right. World problem that could be solved with the right amount of caffeine: I think it could help us figure out how to go about the New Evangelization, which is the response to the widespread loss of faith in our culture. I’d like to see a new evangelism, a new willingness to embrace and live our faith. Perhaps the right amount of caffeine would give people the energy they need to do this!